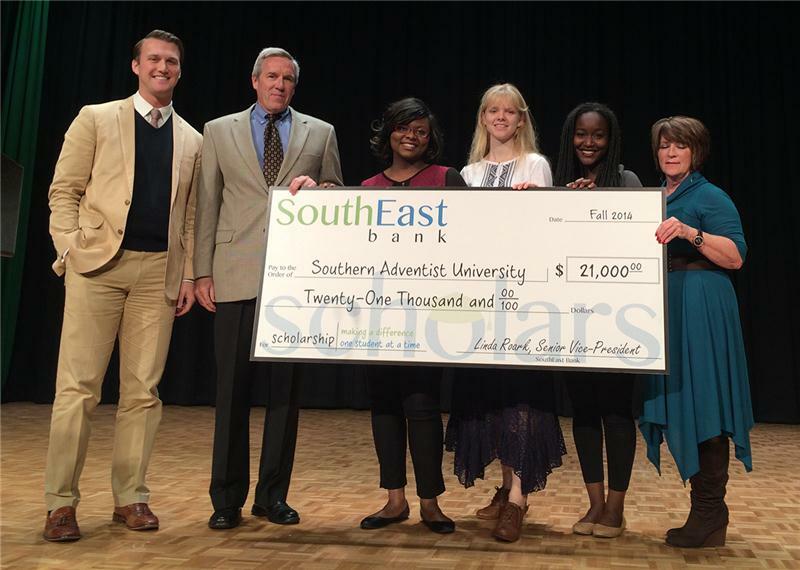 SouthEast Bank, which began in 2002 and now includes 11 locations in Tennessee, participates in a scholarship program to support local students each year at various colleges across the state. In 2011 it began partnering with Southern Adventist University. Three of its students, junior Katarina Weekes, sophomore Caitlyn Bennett, and freshman Joelle Kanyana, were awarded scholarships of $7,000 each. Lloyd L. Montgomery, III, president of SouthEast Bank, and Linda Roark, senior vice president of SouthEast Bank, envisioned the program making a difference in the lives of students and consider the money an important way of giving back to the community. Scholarship recipients must have a composite score of 23 on their ACT or a high school cumulative GPA of 3.25. Students receive the gift each year for four years as long as they maintain a 2.5 GPA while enrolled full-time at Southern. The funds, which have additional criteria beyond grades, are generally given to students majoring in business, finance, or accounting. “I’m grateful for the scholarship because I can now focus more fully on academics instead stressing about my financial burden,” said Ms. Weekes, a business administration and public relations major.